This PMR study offers an eight-year analysis and forecast of the global Waterjet cutting machine market between 2018 and 2026. The Waterjet cutting machine market study considers 2017 as the base year with market values estimated for 2018 and a forecast developed for the duration between 2018 and 2026. Compound Average Growth Rate (CAGR) has been represented from 2018 to 2026. The study covers various perspectives of the global Waterjet cutting machine market, including market dynamics, value chain, pricing analysis, competition analysis, regional and segmental growth comparison and macro-economic, along with segment level projections in a comprehensive manner. As per the findings of the study and perspectives of industry participants, the global Waterjet cutting machine market is projected to grow at a CAGR of 9.0% between 2018 and 2026 in terms of value. Rapid growth in the metal fabrication & automobile sector is the key driving factor for the growth of the global Waterjet cutting machine market. This Persistence Market Research report carefully analyses the Waterjet cutting machine market at a global and regional level through market segmentation on the basis of key parameters such as pump type, application, pressure range and end use industry. The primary objective of the report is to offer key insights on market updates, competition positioning, current trends, market potential, growth rates and other relevant information and statistics in a suitable manner to the readers or various stakeholders in the Waterjet cutting machine market. The report is structured to allow readers to develop a thorough understanding of the Waterjet cutting machine market. It begins with market definitions, which are followed by the market background, market dynamics and market analysis by key segments, regional analysis and competition landscape. Each section covers a qualitative and quantitative assessment of the Waterjet cutting machine market on the basis of facts, historical developments and key opinions collected from industry participants through dedicated interviews and trends in the Waterjet cutting machine market. Subsequent sections of the report provide value (US$ Mn) and volume (New Sales in Units) projections for the Waterjet cutting machine market on the basis of the aforementioned segments at a global level. The global Waterjet cutting machine market values represented in these section have been agglomerated by collecting data and information at a regional level. The Waterjet cutting machine market information, along with key facts and insights, covers unique analysis frameworks, such as absolute $ opportunity analysis, year-on-year growth trend comparison, market share and attractiveness analysis for each of the sub-types covered in each segment of this Waterjet cutting machine report. The next section of the report presents a summarized view of the global Waterjet cutting machine market based on eight prominent regions considered in the study. The section includes regional market position, growth potential, trends and attractiveness analysis for each of these regions. All the above sections evaluate the present market scenario and growth prospects in the global Waterjet cutting machine market while the forecast presented in the sections assesses the market size in terms of volume and value. In order to offer an accurate forecast, we started by sizing the current market, which forms the basis of how the global Waterjet cutting machine market is expected to develop in the future. Given the characteristics of the Waterjet cutting machine market, we triangulated the outcome of three different types of analysis: primary research, secondary research and our own analysis. However, forecasting the market in terms of various Waterjet cutting machine segments and regions is more a matter of quantifying expectations and identifying opportunities rather than rationalizing them after the completion of the forecast exercise. 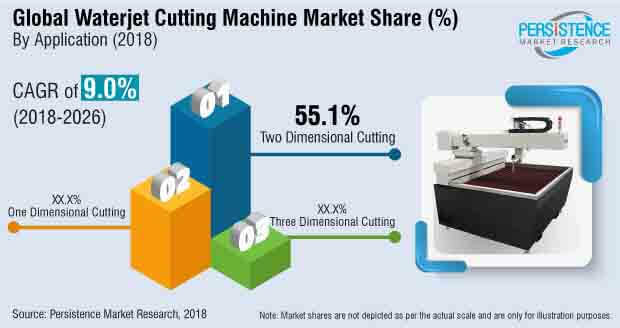 All the Waterjet cutting machine market segments & sub-segments have been analyzed on the basis of Basis Point Share (BPS) to understand each individual segment’s relative contribution to the Waterjet cutting machine market growth. Another key feature of the Waterjet cutting machine market report is the analysis of all the key segments in the Waterjet cutting machine market, sub-segments and the regional adoption and revenue forecast in terms of absolute dollar opportunity. This is traditionally overlooked while forecasting the market; however, the absolute dollar opportunity is critical in assessing the level of opportunity that a provider can look to achieve as well as to identify potential resources from a sales and delivery perspective in the Waterjet cutting machine market. In the final section of the Waterjet cutting machine market report, a competitive landscape of the Waterjet cutting machine market has been included to provide report audiences with a dashboard view categorized on the basis of providers present in the value chain, their presence in the Waterjet cutting machine market and key differentiating factors and strategies. The primary category of providers covered in this Waterjet cutting machine report include Waterjet cutting machine manufacturers. This section is primarily designed to provide clients with an objective and detailed comparative assessment of the key providers specific to a market segment in the value chain of the Waterjet cutting machine market. Report audiences can gain segment-specific vendor insights to identify and evaluate key competitors on the basis of the in-depth assessment of their capabilities and success in the Waterjet cutting machine marketplace. Detailed profiles of the providers have also been included under the scope of the report to evaluate their long- and short-term strategies, key offerings and recent developments in the Waterjet cutting machine market. In this Waterjet Cutting Machine market report, we have considered Waterjet Cutting Machines that are utilized in metal fabrication, automotive, ceramics, electronics & other industries. In this Waterjet Cutting Machine report, we have crunched the market for direct drive pumps and intensifier pumps. The intensifier pump segment is projected to remain dominant in terms of both volume and value market share and is estimated to grow with high value - high growth rate. With the growth in the manufacturing sector, especially in metal fabrication, the demand for intensifier pump Waterjet Cutting machines will increase, which will create significant opportunities for suppliers of Waterjet Cutting Machines in the global Waterjet Cutting Machine market. Rapid growth in the automobile sector is the one of the key driving factors for the growth of global Waterjet cutting machine market. The demand for Waterjet cutting in the automobile sector is increasing constantly. The industry requires precision cutting and strict cutting tolerance, which is well served by Waterjet cutting machines. The market is expected to be further driven by evolving automobile designs and rising demand for automobiles. Demand for automobiles has been increasing rapidly in the recent past, particularly in developing nations of Asia Pacific and Latin America. In the Waterjet Cutting Machine market, A Innovative International Ltd., Caretta Technology s.r.l., CMS Industries, DARDI International Corporation, Flow International Corporation, Foshan Yongshengda Machinery Co., Ltd., H2O Jet, Hornet Cutting Systems, Hypertherm Inc., International Waterjet Machines, Jet Edge, Inc., KMT Waterjet, Koike Aronson, Inc., Metronics Technologies S.L., OMAX Corporation, Plasma Automation Inc., PTV, spol. s r.o., Semyx, LLC, STM Stein-Moser GmbH, Sugino Machine Limited, TECHNI Waterjet, TrennTek GmbH, WARDJet and Waterjet Sweden are some of the prominent players. These days, Waterjet Cutting Machine manufacturers are focusing on introducing new products. Furthermore, all the key market participants in the global Waterjet Cutting Machine market are focusing on establishing strong relationships with dealers to gain market opportunities to increase their sales and widen their reach to distant regions. In the Waterjet Cutting Machine market, Tier-1 players are expected to hold significant share in the global market. Key players have strong presence across the globe. Tier-2 & Tier-3 players are projected to account for approximately 65% to 70% share in the global Waterjet Cutting Machine market and these players are focusing on emerging & developing markets. Our research methodology for this study on Waterjet Cutting Machine market focuses on some key points, such as Defining Research Problems and Objectives; Collecting, Analyzing and Interpreting Information; Selecting Methods of Data Collection; and Deciding the Type of Data and Developing the Final Research Plan. During the research, we conducted a deep dive research analysis on the applications of Waterjet Cutting Machines. Our team collected data pertaining to new Waterjet Cutting Machine sales per region and country from various sources, such as Waterjet Cutting Machine manufacturers’ annual presentations & reports. We also conducted primary interviews with Waterjet Cutting Machine manufacturers, suppliers and experts who have vast experience in the Waterjet Cutting Machine market. How has the Waterjet Cutting Machine market evolved in the past four years? What shape is the Waterjet Cutting Machine market expected to take in terms of volume and value during the study period? What are some of the prevailing market dynamics in the Waterjet Cutting Machine market? What are some of the competition developments and trends affecting the Waterjet Cutting Machine market? What are some of the underlying macro-economic and industry factors impacting the growth of the Waterjet Cutting Machine market? How is the competition structured at present and how has it evolved in the Waterjet Cutting Machine market over the past few years? Some of the key players involved in the manufacturing of Waterjet Cutting Machines and included in this study are A Innovative International Ltd., Caretta Technology s.r.l., CMS Industries, DARDI International Corporation, Flow International Corporation, Foshan Yongshengda Machinery Co., Ltd., H2O Jet, Hornet Cutting Systems, Hypertherm Inc., International Waterjet Machines, Jet Edge, Inc., KMT Waterjet, Koike Aronson, Inc., Metronics Technologies S.L., OMAX Corporation, Plasma Automation Inc., PTV, spol. s r.o., Semyx, LLC, STM Stein-Moser GmbH, Sugino Machine Limited, TECHNI Waterjet, TrennTek GmbH, WARDJet and Waterjet Sweden, among others.